The men of the begging order, referred to as the Minor Brothers and later as Franciscans arrived at Nitra in the 13th century and built a monastery and church here in the years 1624 - 1634. Patrons of the church are Sts Peter and Paul. 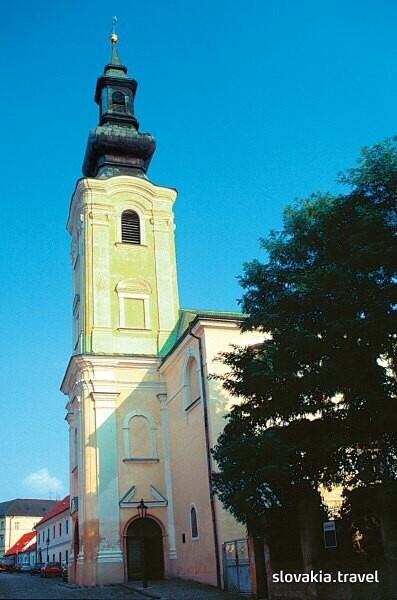 It is a one-nave building with a tower that juts out and three chapels. In the 18th century it was renovated in the Baroque style. The interior is decorated by 33 oak relief sculptures creating the cycle of legendary scenes from the life of St Francis Xavier - the founder of the order. The central altar painting from 1935 depicts the patrons of the church. A valuable stone relief with a scene of Apostles Peter and Paul from the 16th century was later built into the external facade of the church. A second relief depicting the Resurrection of Christ also from the 16th century is placed under the portal in the west part of the chapel. It was transferred here from the Zobor monastery. The monastery is connected with the church by a cloister.